When traveling with paintbrushes, painters need to make sure the brushes tips are safe and their point is protected. Most amateur and professional painters have a roll up travel kit for their brushes. Watercolor brushes need to be stored in a dry but ventilated place, so the dampness could dry off naturally. If brushes are stored in a closed plastic bag when they are still damp, mold will begin to appear and the damp hair may loose its shape. For this reason a rollup is used to store the brushes right after they have been cleaned. First they are placed flat open to dry and later rolled for protection. Watch the short clip below to learn about the Rigger Art brush holder travel kit roll up, made from durable thick canvas. The travel roll up brush holder is 11.8 inches high and 15.7 inches wide, best size to hold long and short handle brushes. Click here to shop Amazon for the premium paintbrushes travel kit roll up. The travel kit can be used by oil painters as well as acrylic painters as well. Most painters use short handle brushes when they paint indoors in their studio, but prefer longer handle brushes when they go outside. Oil painters use long handles usually when painting plein air, or while standing up. No matter if you travel with long handle brushes or with short handle brushes, they need to be carried with maximum protection so they can be used for many years. Throwing the brushes in a bundle at the bottom of the art supply bag, is the worst way to treat them. The fine tip will eventually loose shape and the brushes will not be pleasant to paint with. Get a canvas paintbrush travel kit roll up to keep your brushes stored safely. 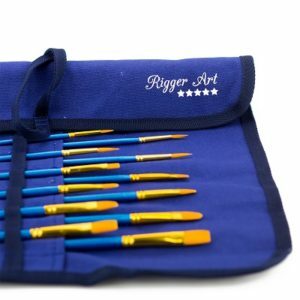 This entry was posted in Paintbrush Holder and tagged Brush Organizer, canvas brush holder, paint brush holder, Paintbrush Canvas Roll Up, Paintbrush Holder Case, Paintbrush Organizer by RiggerArts. Bookmark the permalink.